"The typical indian cuisine" actually doesn't exist at all, what one realizes quickly on a trip through India. One is met with a wonderful multiplicity of different dishes, tasts and aromas. 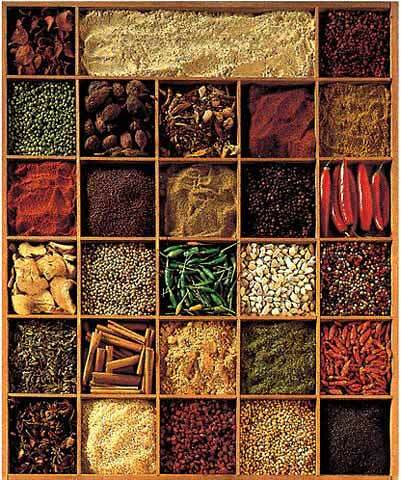 So, each region of India has its own specialties, with which the taste is not only shaped by the extremely high-quality ingredients, but above all through a mixtures of several spices. These individual combinations from fragrant spices, herbs and roots are what gives the kitchen of certain parts of the country its personal touch. 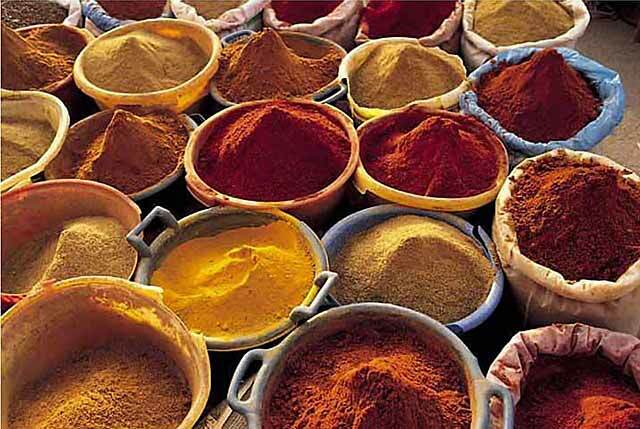 In India the Curries aren't the curry-spices known by us, but they treat of spice-mixtures in countless variations, that each housewife produces from up to 300 grains, herbs and seasonings following peculiar or traditional recipes. 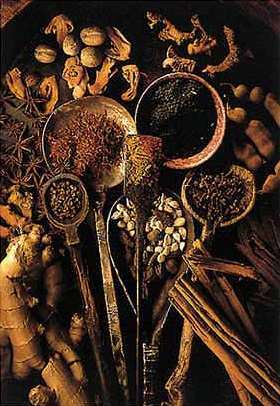 These, turned to sauces, frequently gives the base for miscellaneous curries of vegetable, meat, fish and eggs. However typically also located in the indian kitchen are sheep -, lamb - and poultry - meals as well as crustaceans since the nutrition follows strongly the religious affiliation. Thus, for example, "Hindus" don't eat beef, "Muslims" no pork and "Jainas" are mostly strict vegetarians. Therefore in India is also offered an immense amount of vegetarian dishes, like in no other country of the earth. 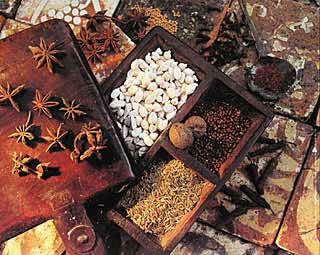 Also very well known spice-mixtures are the indian Massalas. The food in the traditional India is usually very fat, since Ghee (pure butterfat), handmade butter and fatty whole milk is valid as a status symbol and luxury and express affluence, generosity and goodwill to the family and visitors. Vegetable fats in the past were valid as cheap, unappetizing and unhealthy, but in the meantime also used in course of the change of eating habits, to make the dishes "lighter", however in some regions Ghee becomes given still as conclusion over the meals. The traditional cooking in the Tandoor is another peculiarity. These inconspicuous clay oven, delivered hundreds of years ago by mogul-sovereigns to India, give an constant heat from about 1000ºF / 540ºC (a half chicken refines here in less than 5 minutes) and makes thus, by the short time, an extremely careful, healthy and a juicy preparation posible, not at least particularly tasty with an unique flavour. The cooks usually put the ingredients on long skewers and place them for a short time into the oven. Frequently the meat is marinated first. The Balti-specialties for example, inserted before this particular grill-manner into a yogurt sauce with different herbs and seasonings, served after the Tandoori in a special-pan with onions, paprika, garlic and ginger. The Tandoor also becomes prepared in different variations of Nan, a kind of typical indian flat cake, just done directly before the consumption. Nan is baked in a certain manner pasted on the internal wall of the oven. Also other bread-specialties like Chapati-a flat cake, prepared only from flour and water, baked on a round plate over the fire, Roti, Paratha and Papadoms (from chickpea-flour) becomes, given together with other basic foods like Dal (lentil-puree), vegetables and Pullao or Chawal (rice) as supplements. Only in the north of India with water from melted ice of the Himalaya grows the famous real Basmati rice, that bribes through his exclusives aroma and his high quality, which also brought to him the well-known-name "King-of-rice". This basmati-rice in good restaurants is offered in different manners, enriched through exclusive selected ingredients like saffron, nuts or mushrooms etc. As small snacks or appetizers They are used to eat Pakorases ( in dough rolled vegetables, eggs etc.) Samosas (a kind of pie, filled with vegetables or potatoes) or Dosas (crispy paste-roles filled with vegetables). In order to become familiar with the Indian cuisine, or if you would not like to decide youself to a certain meal, it is recommendable to select a Thali, a tray with a combination of different foods and bread. The indian food mostly is rather hot. This sharpness works strongly digestive stimulating and antiseptic, which helps to avoid digestive problems and intestine infections, that are extensive in India due the frequent primitive hygienic circumstances. Of course one can select the sharpness degree of the taste depending on his pleasure. If it is desired, one could get also the very soft preparation , for example refined with coconut. Coconut is also used in order to tone down a too spicy meal. Originally, the Indians eat with the fingers, that for only the right hand is used like "cutlery". So the individual components of a meal are mixed together and were piled up as turrets and sented knowingly by fingers, formed like a spoon, into the mouth. As desserts they give several sweets, prepared from nuts, coconut, pistachios and a multiplicity of exotically fruits, that also gets frequently their secretfull taste through miscellaneous spices. Or they serve desserts made from fresh cheese, frequently formed to little balls and refined with different sauces, fruity or fresh, for example with mint or mango. Also on sale are several classes of ice cream and recently sorbets (Kulfi). Also as a sweet conclusion, some takes the Lassi, a mixdrink from yogurt, milk or water, that is also available in a salted variation, gives for example with roasted caraway. Or try the indian tea, Chai, that is usually made without water, from milk and aromas like cardamom, cinnamon or massala. Of course one also gets the tea in our preparation. Finally India is an area of cultivation of top-kinds-tea, but also coffee is drunk. The cheapest beverage in India is the coconut-milk, soda or softdrinks aren't recommended there, because they are frequently adulterated. 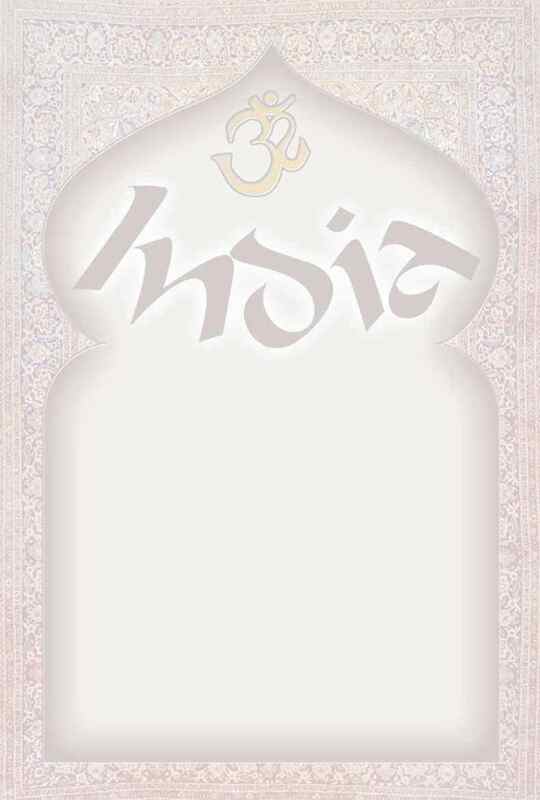 You could take alcohol in India, even beer is brewed, but it is rather scorned for religious reasons, especially in the higher castes. 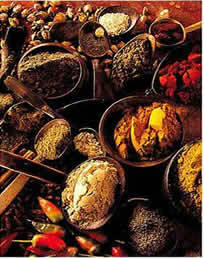 Plunge into the adventure of the INDIAN CUISINE and have yourself bewitched from the variety of the aromas!